I traveled about 80.8 miles today. Beautiful day today, definitely in the top five for incredible scenery. This picture is my view when I was a few miles from Washington pass. The pass is to the right of the prominent mountain, you can see the switchback heading from left to right up the mountain side. 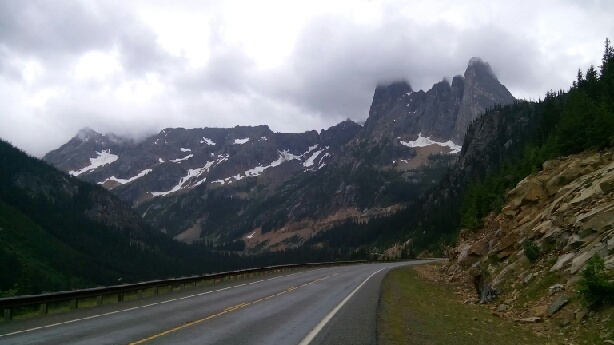 Started raining at the pass, and the temp was pretty cold. Still great views going down, but the wind and wet and cold was not fun. You go so fast down the mountain that the rain hurts when it hits your face. Cadence took a slower pace than I did, and ended up hitchhiking down the mountain because she was starting to get hypothermia. Diablo lake was beautiful to see. So blue! The temperature warmed up as I dropped elevation, which was nice. Spent some time warning up in New Whalen before continuing to Marblemount. Staying with Rob and John Scott tonight, really cool warm showers hosts. They live on Rivendell lane, in a cabin/house that would not be out of place in middle earth. More mechanical problems today. The last few days felt like I was working harder than I should have, but I just chalked it up to fatigue from going over so many passes. Today I stared getting funny sounds from my rear wheel. I took the wheel off the bike when I was done today, and something is wrong with the bearing (as I suspected). My guess is that when I had the spoke replaced in colville, something got messed up with the axle/bearings. Possibly the cones weren't tightened correctly. I'll bring it to the bike shop in Burlington tomorrow, hopefully the bearings aren't shot. Just have to get the fifty miles there. I'll hit the bearing with some tri flow tonight, hopefully that'll keep then from getting worse. It is amazing that your bike is still hanging in there. Thought for sure you would be needing a new bike somewhere along the trip. Good luck on fixing it up so you can finish you planned route with it. What will we do when we no longer have a blog to read or follow you on your map? Thanks for an interesting summer.